All of our mixes are made in small batches using quality ingredients. 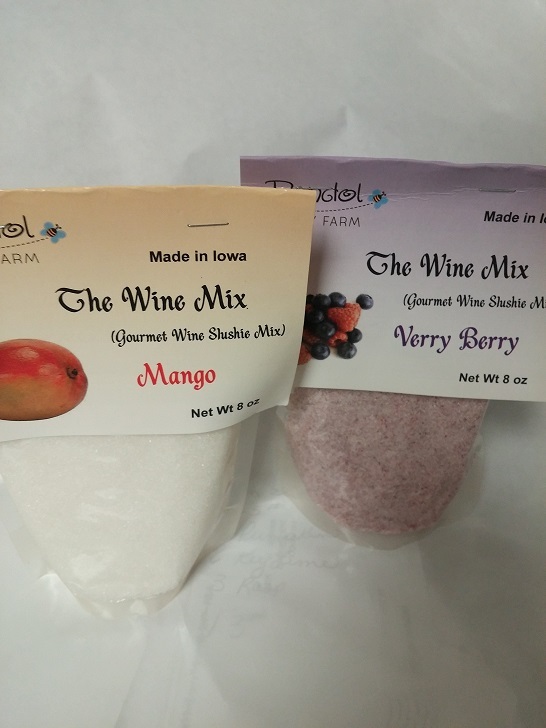 You will simply love our new Gourmet wine Slushy mix. Blender Method:Add 1/2 mix package (1/2 Cup) (Less if too sweet) of mix to blender with 12 oz (1 1/2 cups) of your favorite red or white dry or semi dry wine, blend, then fill blender with ice. Blend until smooth and pour into wine glasses for a delicious frozen wine smoothie. Freezer Method: take a zip lock gallon Freezer Bag add entire package of mix, 1 Bottle of wine and 1 wine bottle of water, mix until dissolved and put into freezer until slushy. Flavors to choose from are Very Berry, Peach, Pina Colada, and Mango. All go well with white wines, Very Berry is best with red wines.